← How do you fix broken arm sockets in He-Man type figures? Fixing a bent vintage figure accessory. This fix is intended for accessories made out of the same type material as vintage MOTU accessories. It may however work on many more! 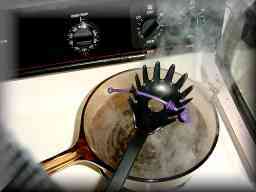 Boil some water, and lower the accessory in with a spaghetti spoon. Do not let it touch the bottom of the pot, or it may melt. If it doesnt straighten itself, a little manipulation may be needed.